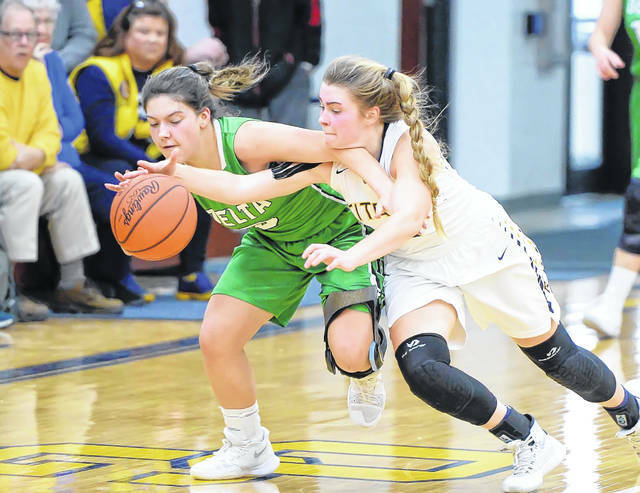 Ottawa-Glandorf’s Kelsey Erford, right, fights for a loose ball against Delta’s Alayna Mitchell during Saturday’s game at Robert J. Hermiller Gymnasium in Ottawa. See more girls high school basketball photos at LimaScores.com. Ottawa-Glandorf senior Erin Kaufman puts up a shot against Delta’s Jessie Giguere during Saturday’s game at Robert J. Hermiller Gymnasium in Ottawa. Ottawa-Glandorf’s Brianna Schimmoeller puts up a shot against Delta’s Brooklyn Wymer during Saturday’s game at Robert J. Hermiller Gymnasium in Ottawa. Ottawa-Glandorf’s Brianna Schimmoeller puts up a shot against Delta’s Braelyn Wymer during Saturday’s game at Robert J. Hermiller Gymnasium in Ottawa. 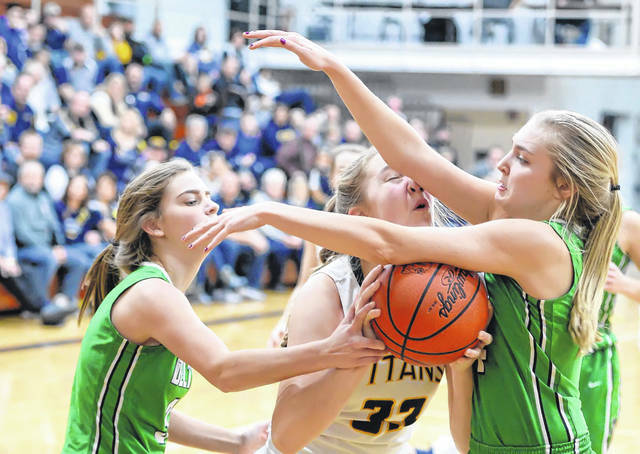 Ottawa-Glandorf freshman Erin Kaufman tries to put up a shot against Delta’s Reagan Rouleau, left, and Braelyn Wymer during Saturday’s game at Robert J. Hermiller Gymnasium in Ottawa. Ottawa-Glandorf’s Kelsey Erford puts up a shot during during Saturday’s game against Delta at Robert J. Hermiller Gymnasium in Ottawa. 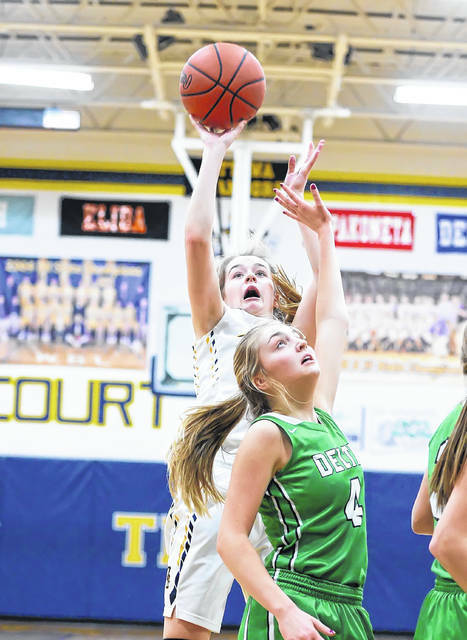 OTTAWA — The fans at Saturday afternoon’s top-10 state-ranked girls basketball matchup between Delta (ranked 10th in Division III) and Ottawa-Glandorf (fourth) got extra action as the game went into overtime. The Titans (16-1) had the better of the proceedings in that extra four minutes, outscoring the 14-2 Panthers 13-6 to grab a 51-44 victory. Delta head coach Ryan Ripke was pleased with his team’s effort. Tied at 38 to begin overtime, the Titans’ scored first on a free throw from freshman Erin Kaufman at 3:55. 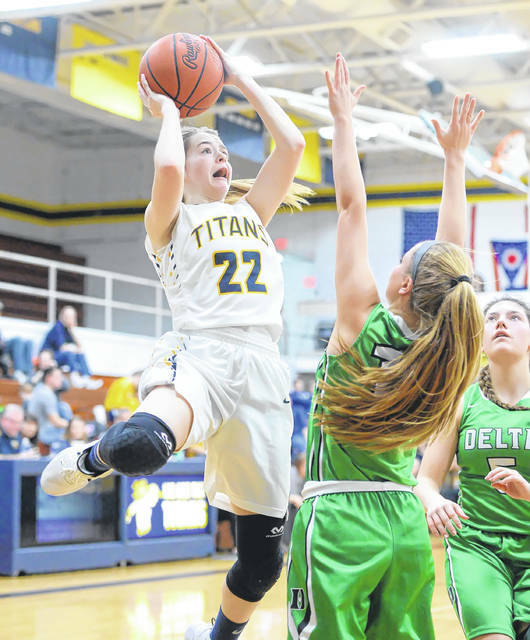 Delta’s Brooklyn Green (10 points) countered with a basket at 2:45 but when O-G’s Kasey Ellerbrock (13 points) buried a 3-pointer at the 2:25 mark, that gave the Titans the lead for good. Ellerbrock and Kelsey Erford (12 points) hit a pair of free throws each around a pair of foul shots by Green to make it a 46-42 Ottawa-Glandorf lead. In the last 23 seconds, O-G finished it off by hitting 3-of-4 foul shots – hitting 8-10 of the overtime – to put the game away. With an even matchup from the start, the defenses ruled the first period, as they would all game long. The teams combined for 7-of-20 shooting in the first period as O-G led 9-6 on a basket from Ellerbrock before a layin from the Panthers’ Jessie Giguere at the 20-second mark accounted for a 9-8 score on behalf of the Titans after eight minutes of action. O-G heated up in the second period, canning 6-of-11 shots from the field to Delta’s 3-of-9, led by Erford’s eight points. That allowed the Titans to steadily build a 25-16 edge by halftime after Ellerbrock dropped a 3-pointer at the 30-second mark of the second period. Delta came out of the halftime break and hit the first five points of the third period to slowly whittle away at the deficit. 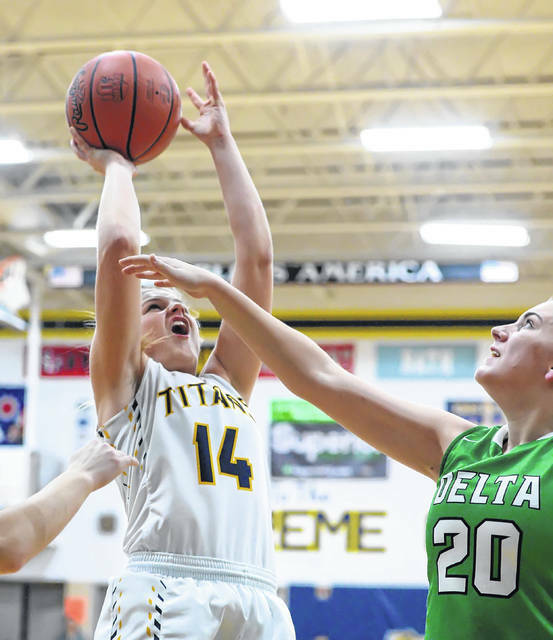 Delta’s defense had a better handle of the Titans’ offense, holding it to seven points (3-of-11 shooting) in the period, and when Alayna Mitchell hit the first of two free throws at 1:09, that got the Panthers within 32-25 to start the fourth period. Delta kept coming in the fourth stanza. Behind eight points from Braelyn Wymer (17 for the game) in the period, the Panthers were within 36-35 on a basket from Freeman at the 2:32 mark. Missing two front ends of the 1-and-1 in a 53-second span, Ottawa-Glandorf finally scored at 1:31 on a basket from senior Erin Kaufman (14 points), who was playing with four fouls. At 1:10, Wymer buried a 3-pointer from the left wing to tie it at 38. When O-G had a turnover (one of 18 for the game) afterward, Delta had a chance to win in regulation but instead turned it over (16 for the game) as time was running out before getting off a shot. 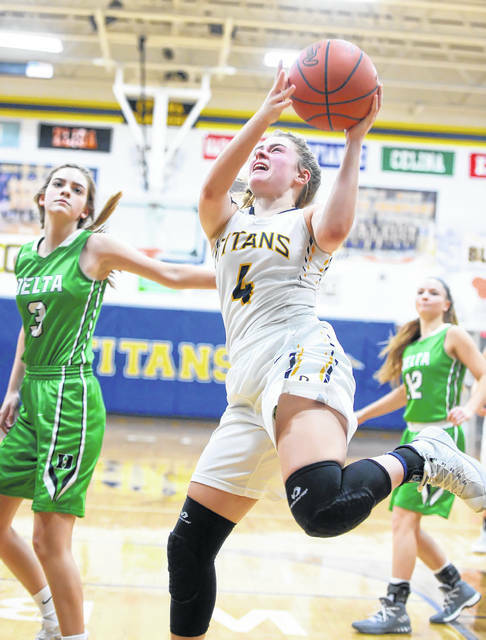 Ottawa-Glandorf finished the game shooting 17-of-43 (6-of-20 from 3-point range) for 39 percent versus Delta’s mark of 15-of-41 (6-of-15 3-pointers - for 37 percent.